It took ventriloquist, singer, comedian and celebrity impressionist Terry Fator 32 years to become an overnight sensation when he won the hearts of America and was selected "America's Got Talent" 2007 $1 million dollar prize winner on NBC-TV. His key decision to blend those incredible skills with his amazing ability to mimic famous singers won over the judges and millions of fans who voted for him. He recently performed to rave reviews on "THE OPRAH WINFREY SHOW" and guest Simon Cowell called him ONE OF THE BEST ENTERTAINERS IN THE WORLD. His May 15, 2008 performance on THE LATE SHOW WITH DAVID LETTERMAN was a dream come true. Letterman mentioned in his intro that "we tried to get Terry on the show for two years; we finally got him and it- was well worth it." Dave joined Fator on stage after an exciting performance, shook his hand and exclaimed "Wow that was great. What a job!" The Mirage Hotel in Las Vegas recently held a press conference to announce that Fator signed a five-year $100 hundred million dollar deal beginning February 2009, with an option for an additional five years at $110 million dollars. He will perform 48 weeks a year, 5 nights a week in The Terry Fator Theatre (currently the Danny Gans Theatre). Fator will continue to perform monthly at the Las Vegas Hilton through 2008 and in sold out concerts nationwide. "This is an unbelievable dream come true, and I am looking forward to becoming a member of The Mirage family" states Fator. Terry is perhaps the first entertainer to combine the art of ventriloquism with singing celebrity impressions. His puppets, including Cowboy Walter, Emma Taylor and Winston the Impersonating Turtle, effortlessly perform the singing styles of an eclectic group of stars including: Tony Bennett, Elvis, Maroon 5, Garth Brooks, Nat King and Natalie Cole, Roy Orbison, Etta James, Gnarls Barkley, James Blunt, Brooks & Dunn, Louis Armstrong and even Kermit The Frog. 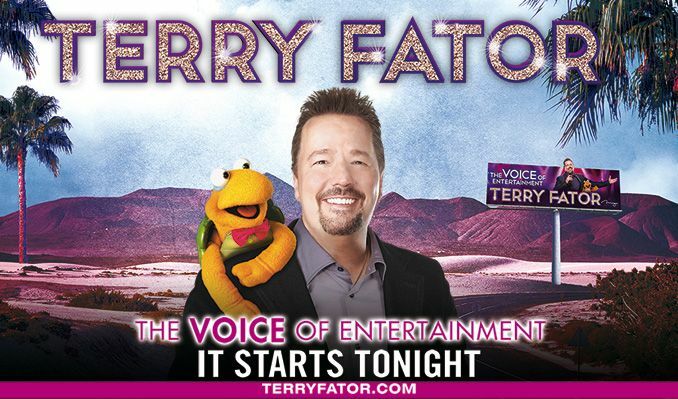 The long road from a young boy's dream of becoming a great entertainer to being named America's top talent wasn't an easy one, but Terry Fator has traveled it faithfully and finally arrived on top! Terry is currently writing his autobiography, WHO'S THE DUMMY NOW? which will be released later this year. Terry Fator is truly living the American dream, and has the opportunity to do what he loves each night: entertain audiences of all ages with his wholesome blend of family entertainment and dazzle them with his amazing talent.